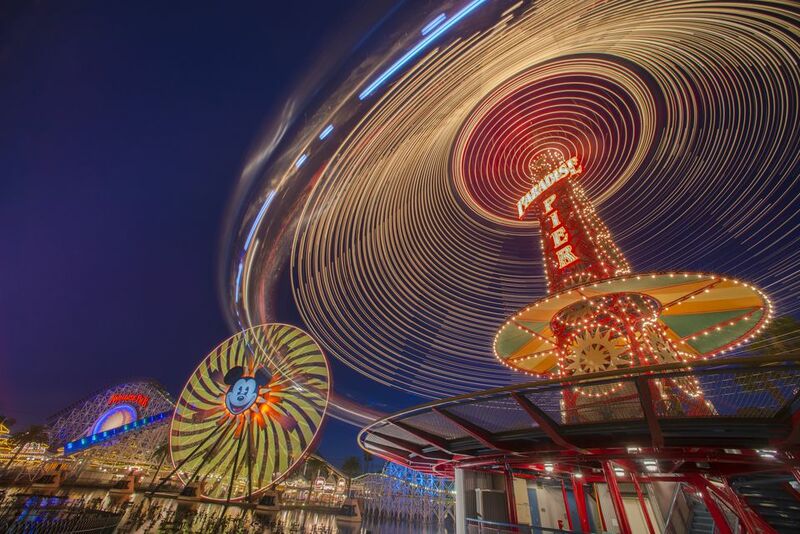 Here you'll find a brief overview of Disney California Adventure rides and attractions. Disney California Adventure closes various rides for periodic maintenance, and some have limited hours. To get the current status of every ride, you can visit the Disneyland website. However, their schedule only goes out a month. Unless there's a planned renovation underway, there's no way to know whether your favorite ride will be running on future dates. The rides are organized by area, clockwise starting left from the entrance plaza on Buena Vista Street. The links will take you to a detailed profile and review of each of the most popular rides, which includes ratings, tips, ride times and trivia — along with factors for fun, wait times and the likelihood of motion sickness. You can also quickly look through the ratings to find the best rides — or scan the minimum height listings to find out whether you need to start setting expectations for your kids. Buena Vista Street is the street where Disney Studios are located in Burbank, and this themed entry area recalls the days in 1923 when Walt Disney first arrived in Southern California. The Carthay Circle Theatre recreates the movie house where the animated film Snow White and Seven Dwarfs premiered. A Red Car Trolley rolls past the Storytellers statue of Walt and Mickey in the early days. Citizens of Buena Vista Street stroll past and entertainers show up to sing and dance. The daily Pixar Play Parade starts at Paradise Pier and ends on Buena Vista Street. This street looks like how Hollywood would do Hollywood. It has lots of touches that refer to local sights and is also one of the best places to meet the characters. The area is themed for those Pixar films that everyone loves. It closes early for the World of Color show, which happens in the lagoon. The Grizzly bear on the mountain is an easy way to find this small area that pays tribute to California's forests and woodlands. A Bug's Land closed in September 2018 to make way for a new area themed around Marvel Comics, which is set to open in 2020. California Adventure's newest land gets its inspiration from Old Route 66, the classic highway across America. 1If you don't mind riding in a single available seat instead of next to your companions, go to the single rider line. This option will get you on board a lot sooner.